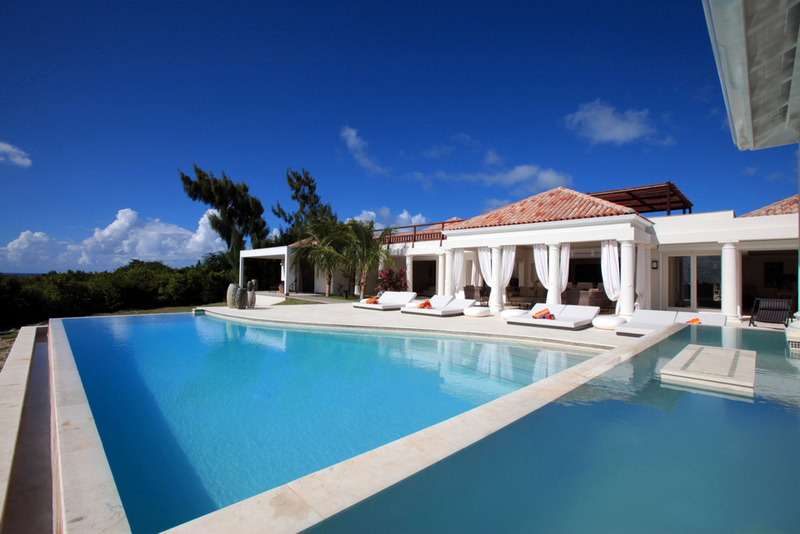 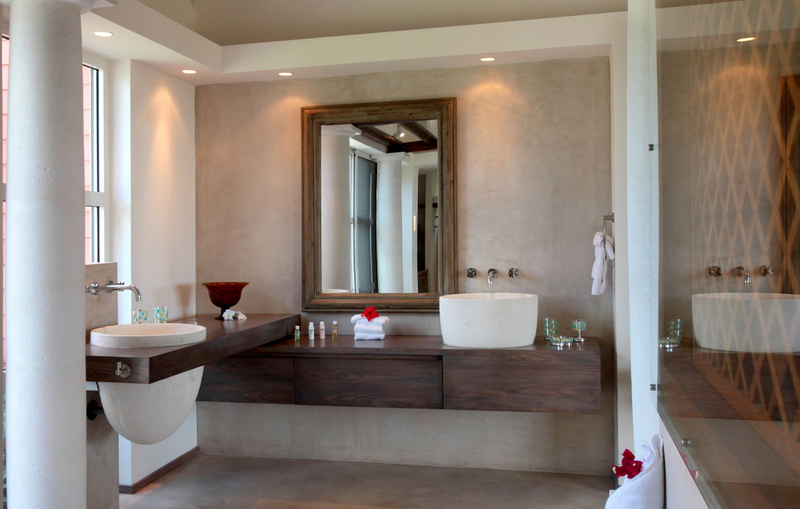 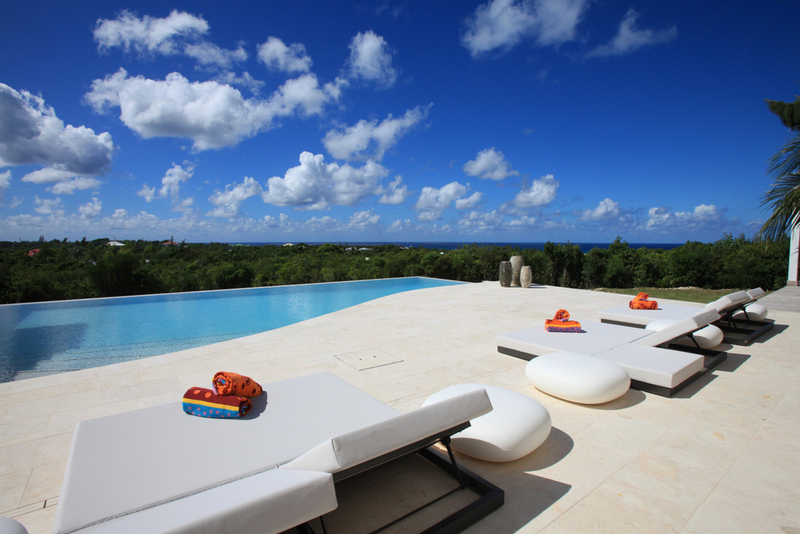 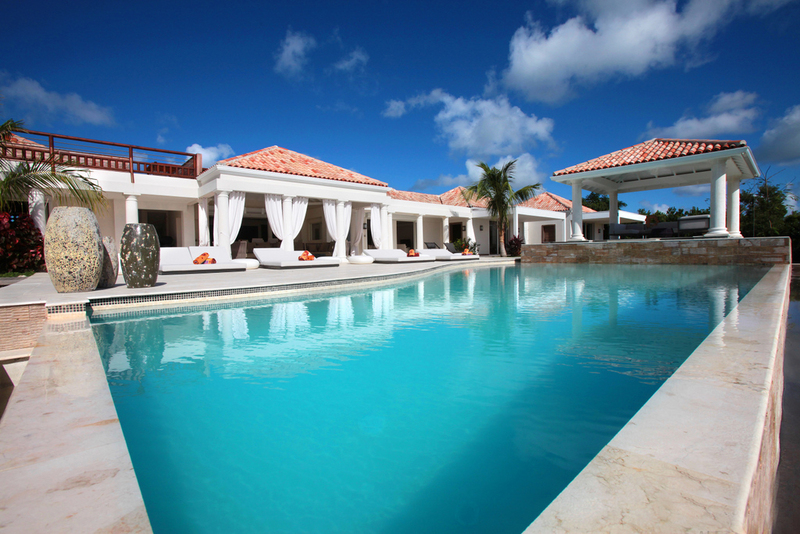 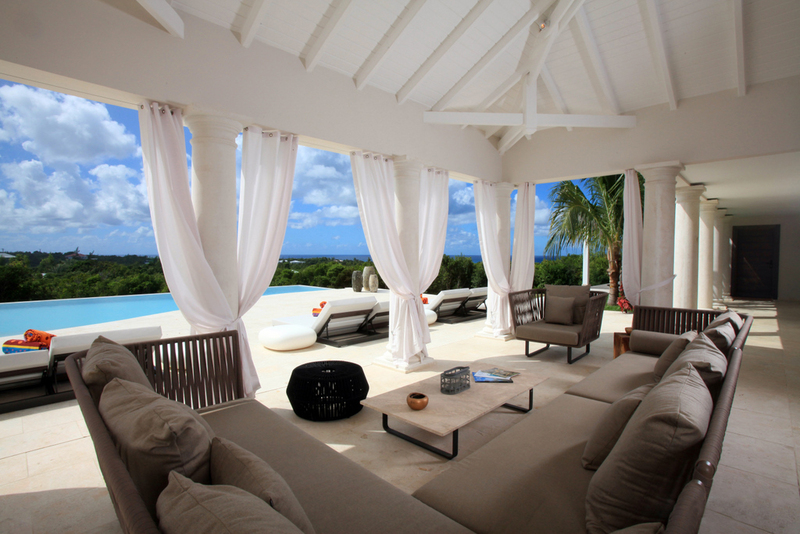 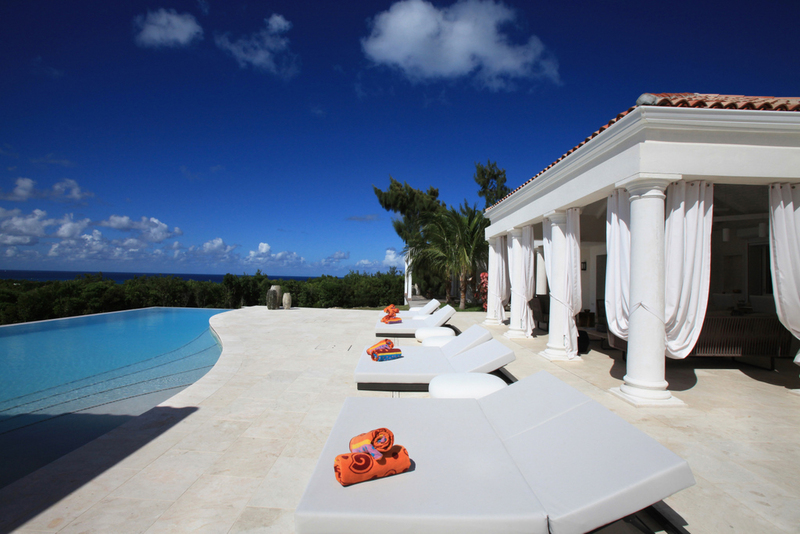 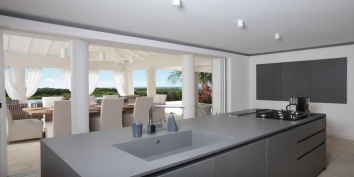 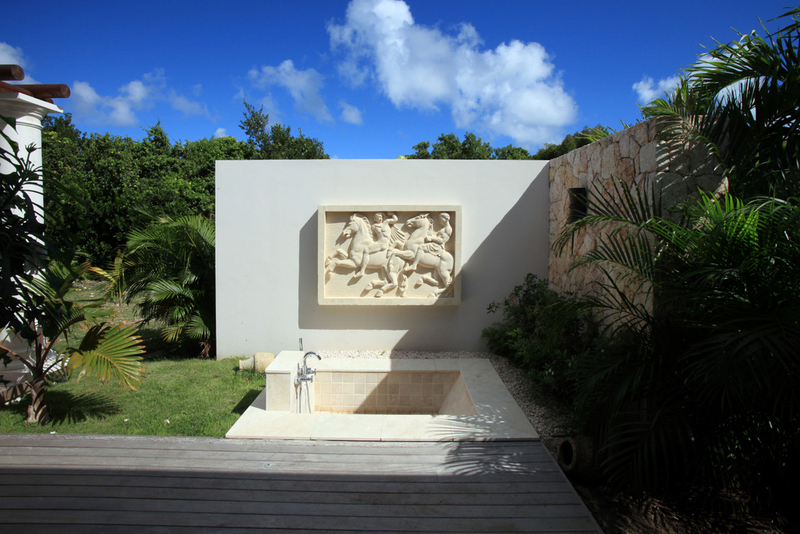 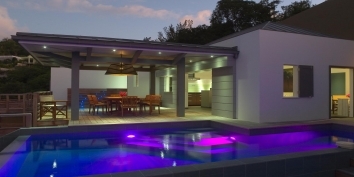 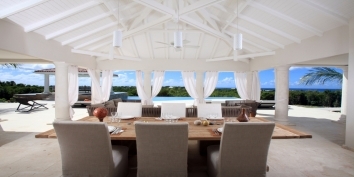 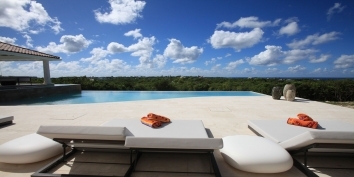 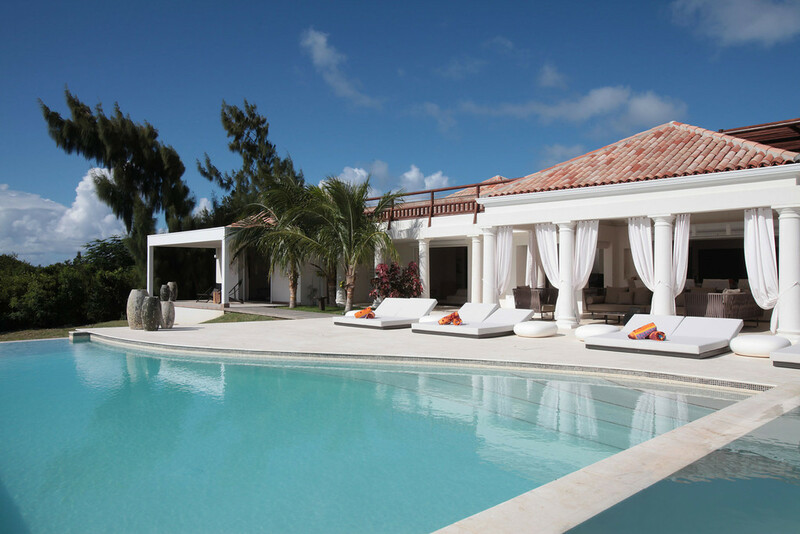 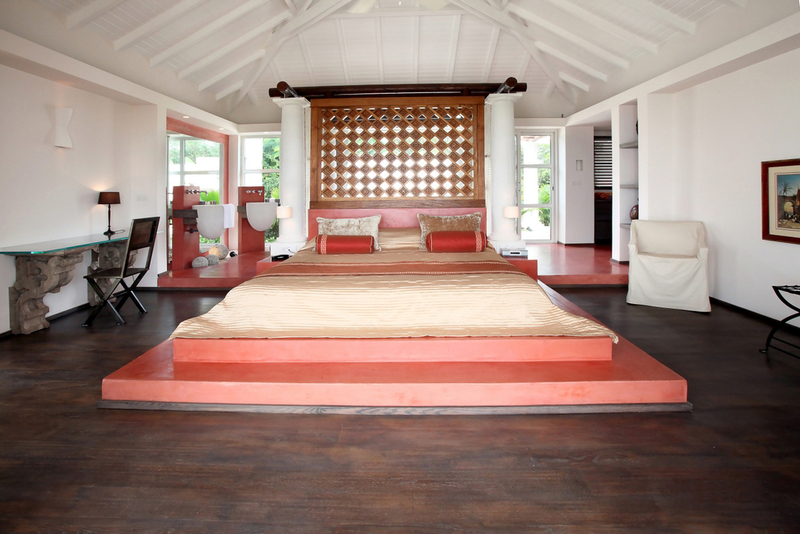 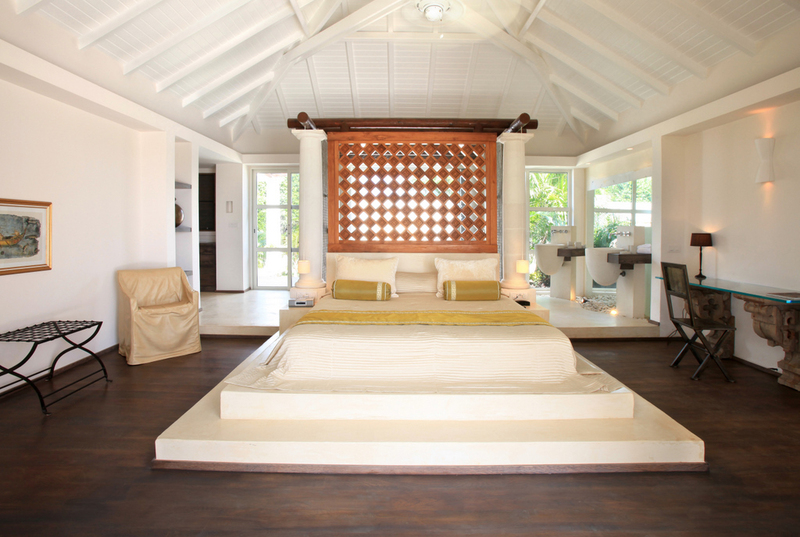 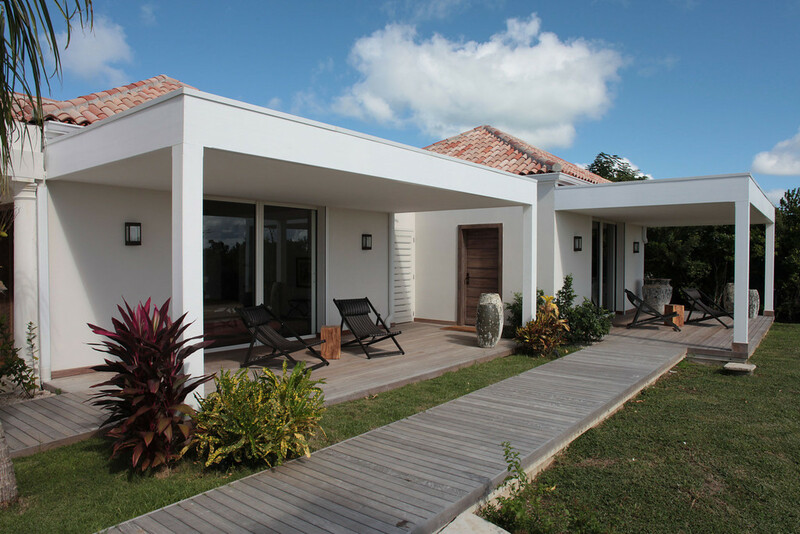 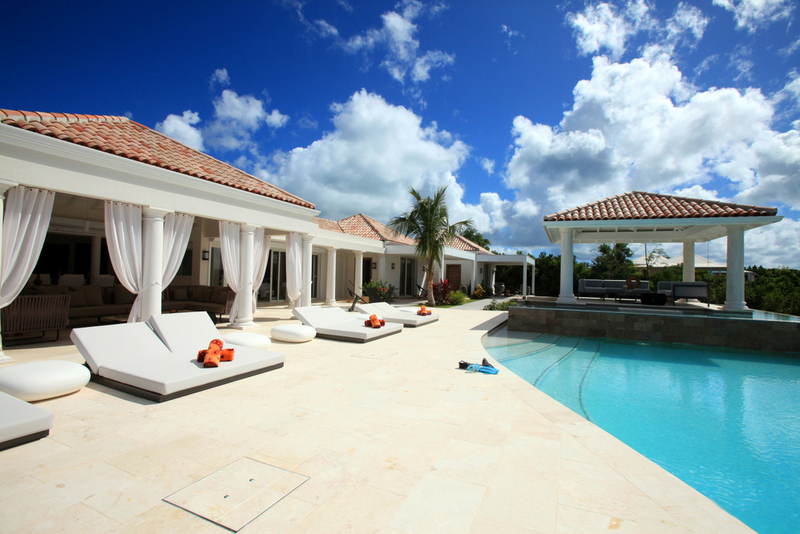 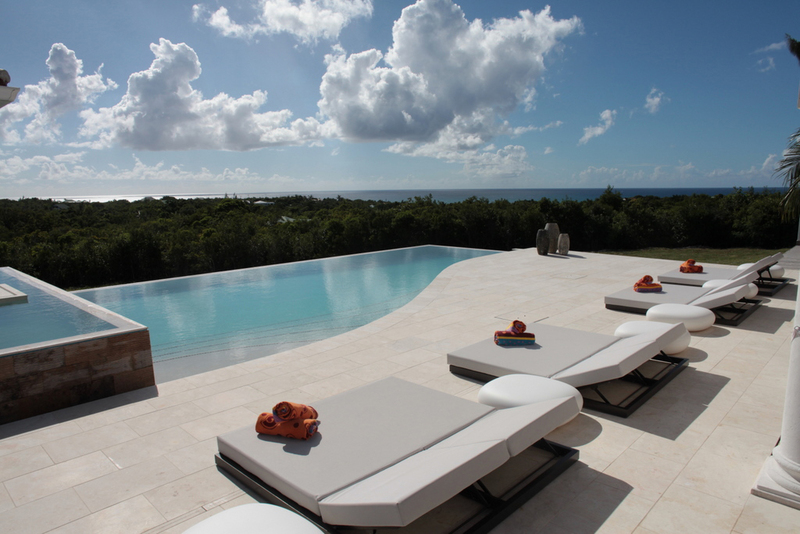 L'Agora is a modern, spacious, luxuriously decorated 4 bedroom villa overlooking the Caribbean Sea. 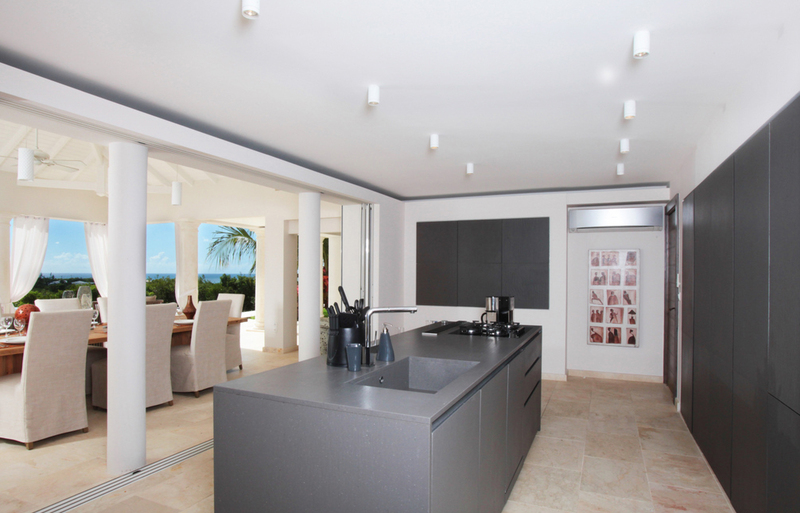 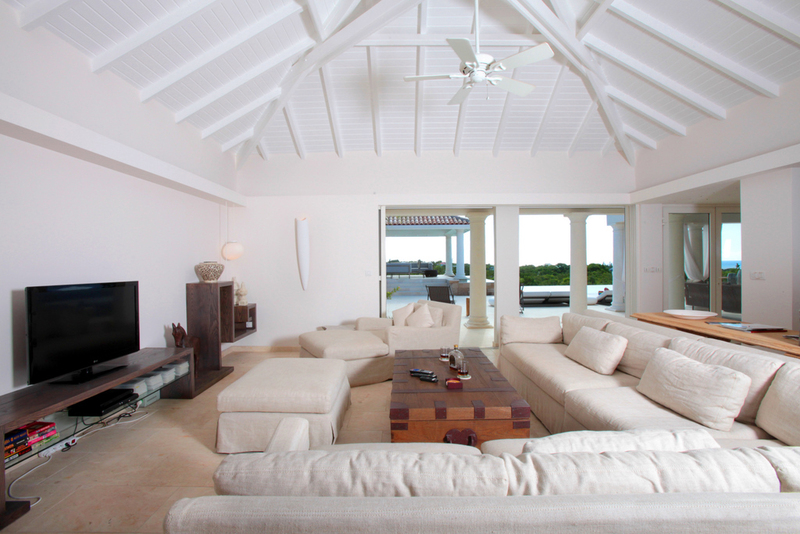 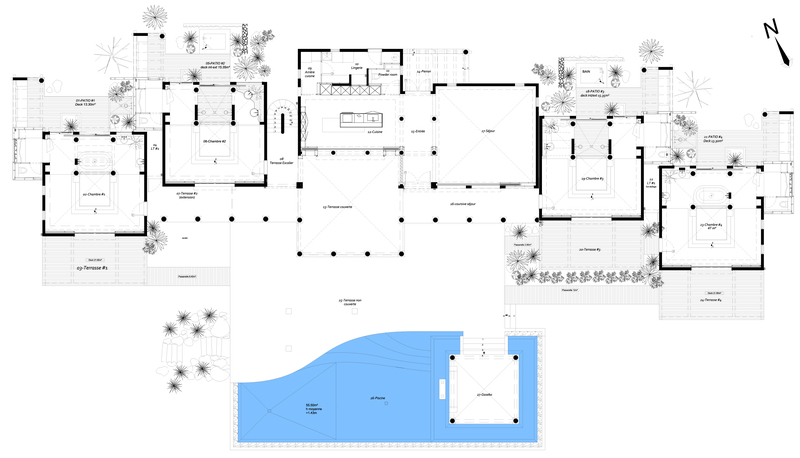 The interior of this Caribbean villa offers a huge and beautiful living room, kitchen and covered dining room. 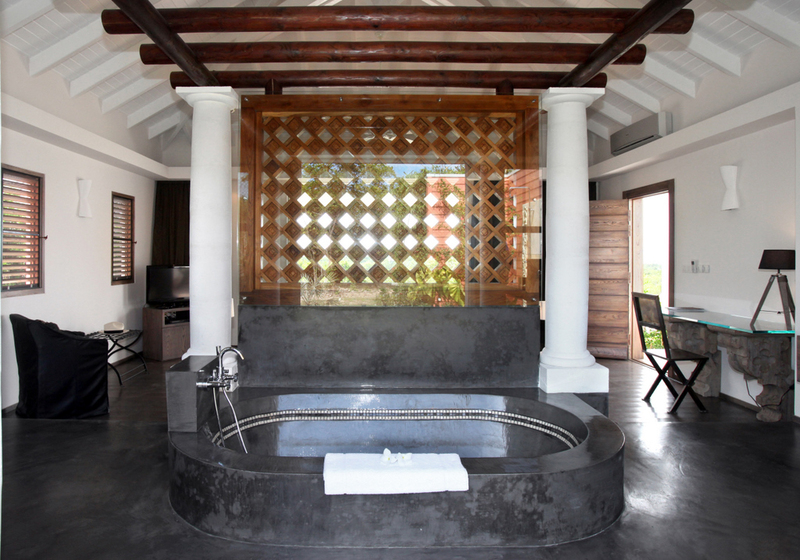 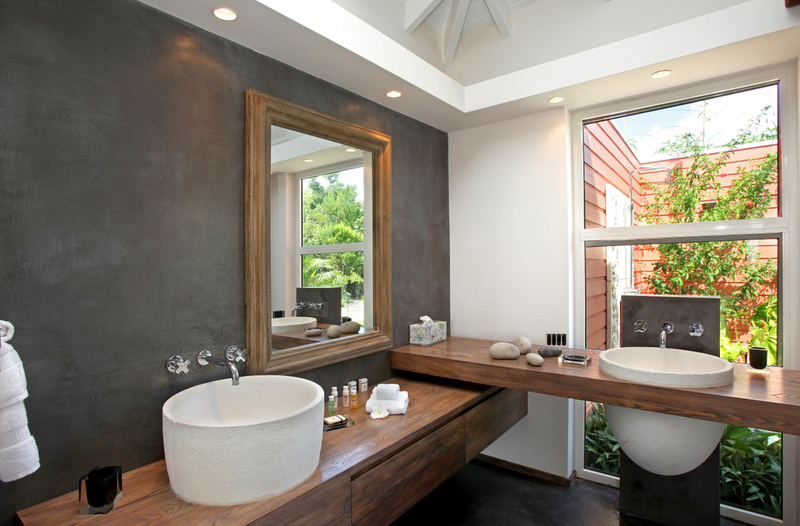 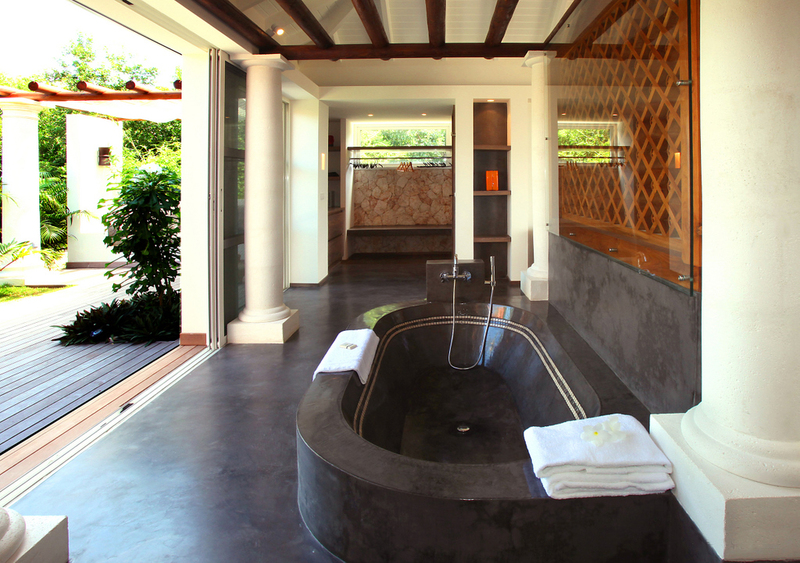 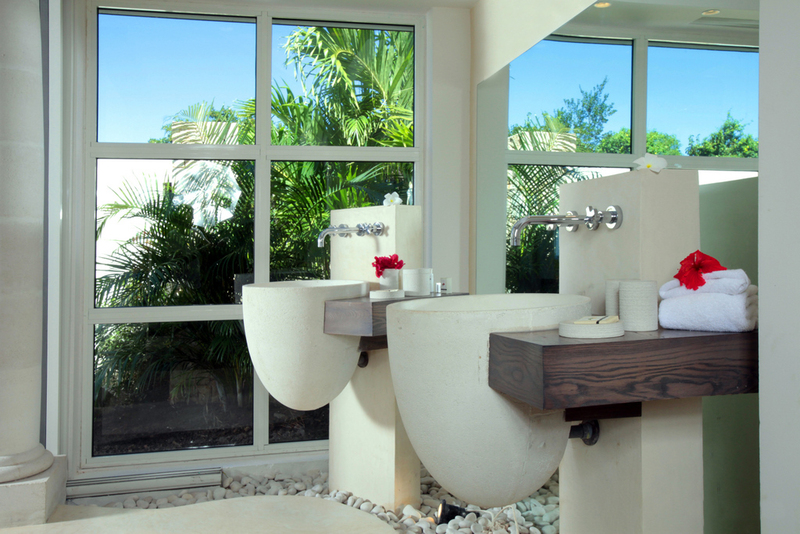 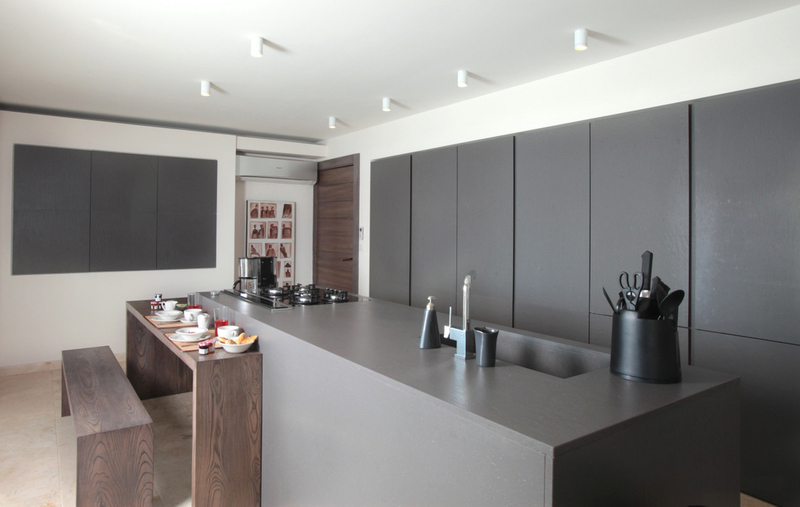 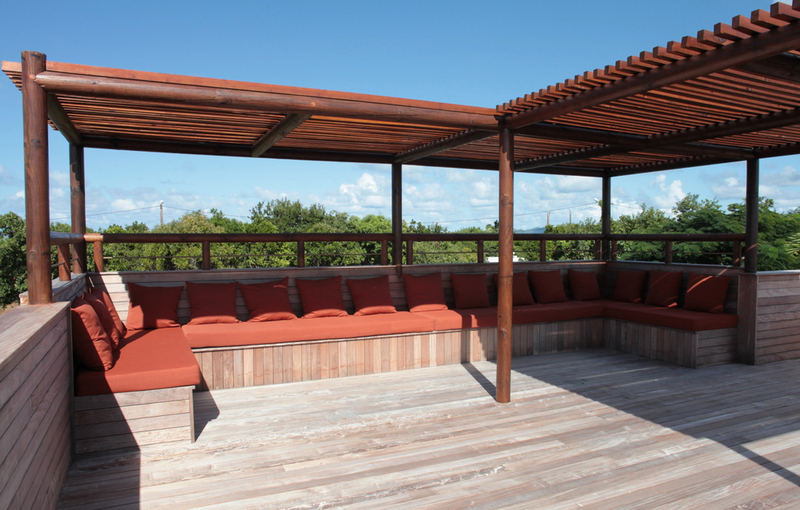 Designed for space and privacy, you will love the roman and modern style of L’Agora. The living room features a wide-screen TV, DVD player, satellite and a large collection of movies for entertainement. 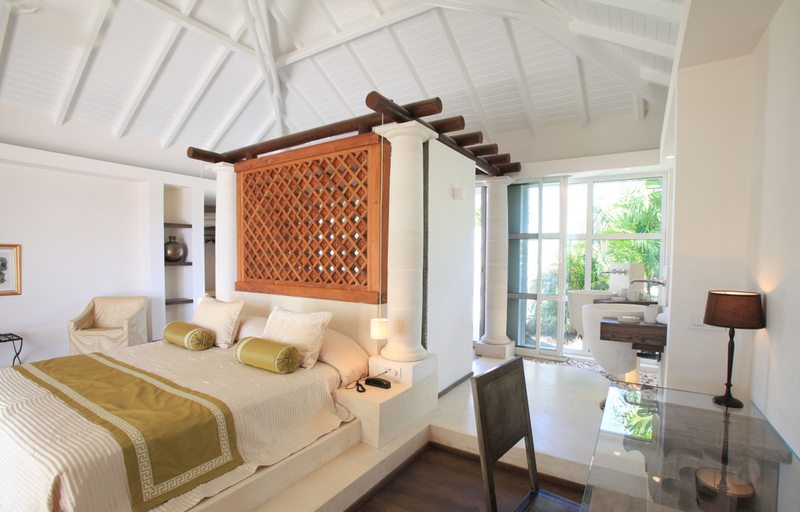 Wi-Fi internet access is provided at no extra cost. The kitchen is fully equipped with 2 full size refrigerators, ice maker, dishwasher, oven, gas stove, microwave, toaster, blender and coffee maker. 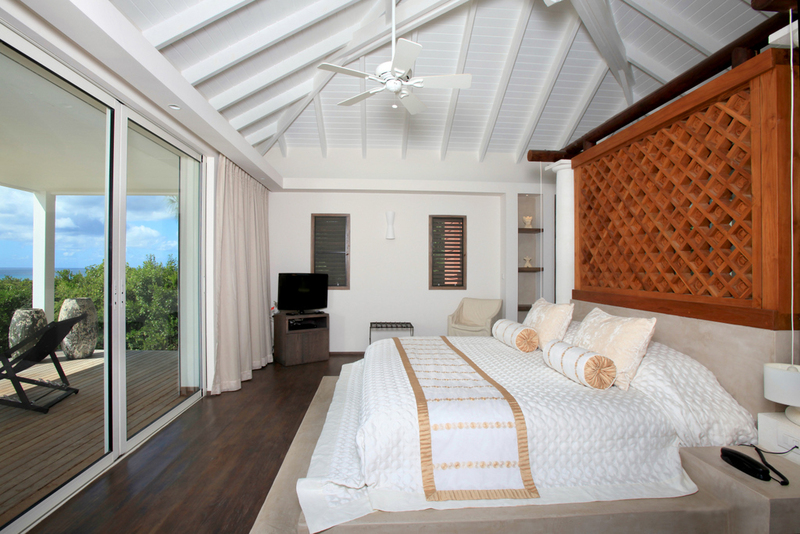 L’Agora includes four air-conditioned bedrooms; all of them featured with a king size bed, a private bathroom, a TV and a DVD player. 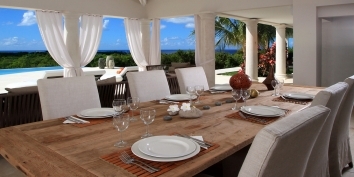 This St. Martin villa rental is perfect for three or four couples, two couples with children or a big family. 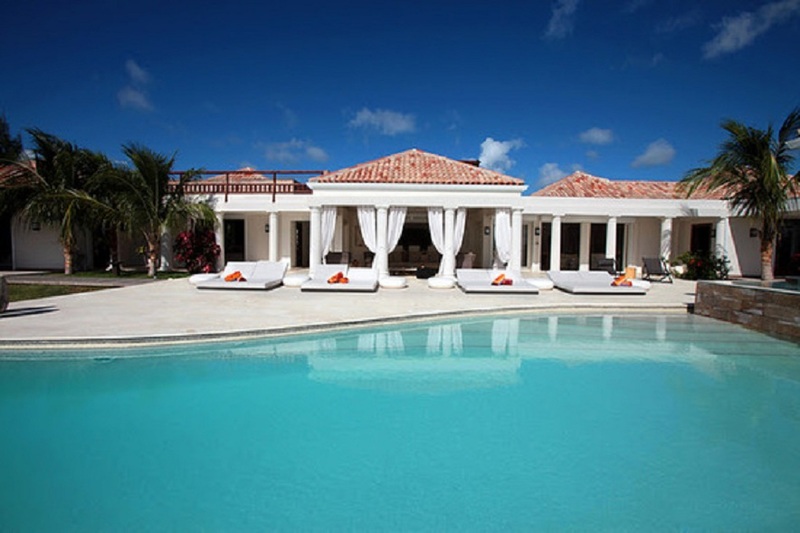 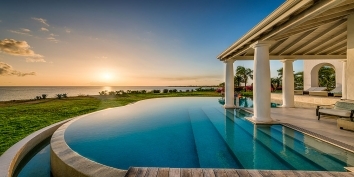 Everyone will enjoy their own privacy in this spacious vacation villa. 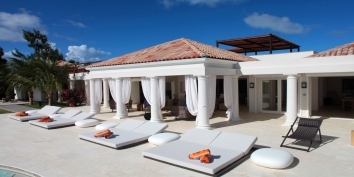 Can be rented as a 2-3 or 4 bedroom villa! 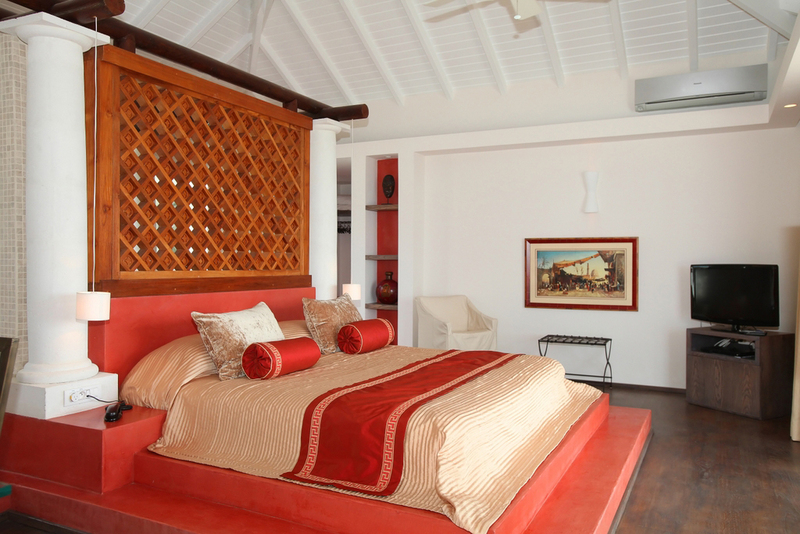 Four spacious air-conditioned bedrooms with King size bed and complete en-suite bathroom. 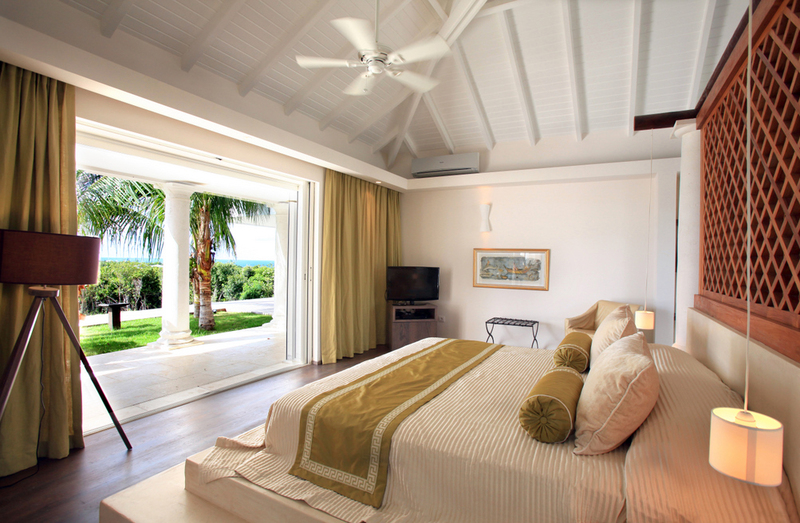 Outside bath or shower, flat screen TV, DVD player and clock radio with iPod dock, personal safe and hairdryer in each bedroom. 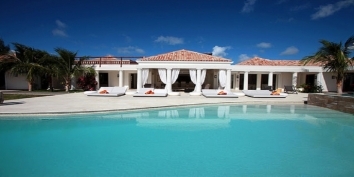 Can be rented as a 2-3 or 4 bedroom villa ! 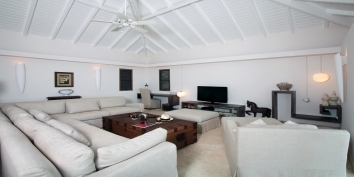 Air-conditioned living room with wide-screen TV, satellite receiver and DVD player, free WiFi-Internet connection. 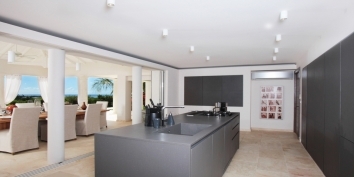 Very modern and fully equipped kitchen with dishwasher, electric oven, gas cooktops, refrigerator with ice maker, microwave, coffee maker, toaster, blender and much more …. Covered terrace with dining and lounging area. 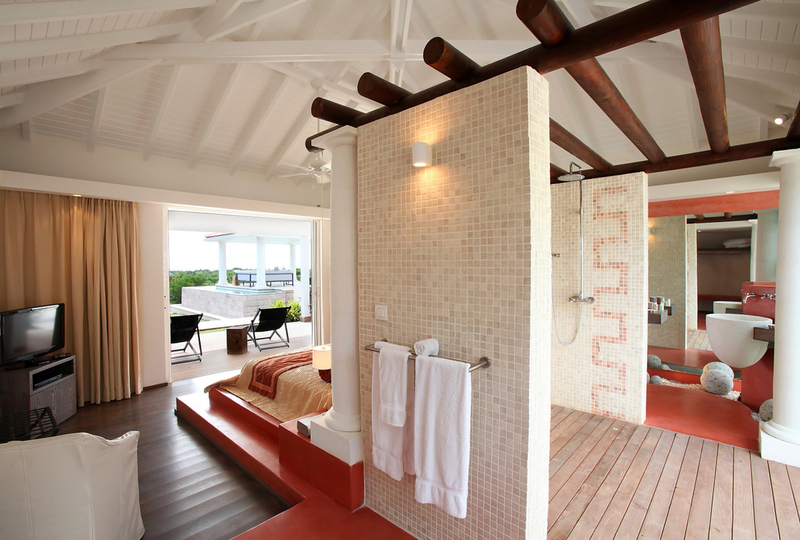 En-suite bathroom with outside bath or shower in each bedroom. 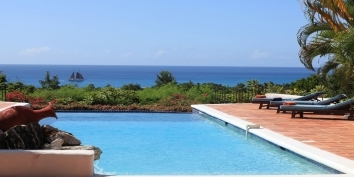 • To Airport: 16 min drive. 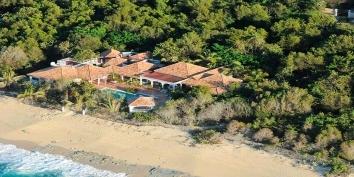 • To Beach: 2-3 min. drive.